Book Jasper Tours with Viator | 6 Reasons You Should Visit Jasper | Jasper or Banff? Jasper, Alberta, is a luscious little town tucked into the Canadian Rockies not far from the British Columbia border. Access to Jasper is generally via Edmonton 4 hours to the east or Calgary, 5 hours southeast. Jasper, the town, is part of Jasper National Park, one of Canada's largest and oldest national parks. With a natural backdrop as breathtaking as Jasper - its turquoise lakes and soaring Rocky Mountains - one hardly needs tourist attractions to appreciate its beauty. 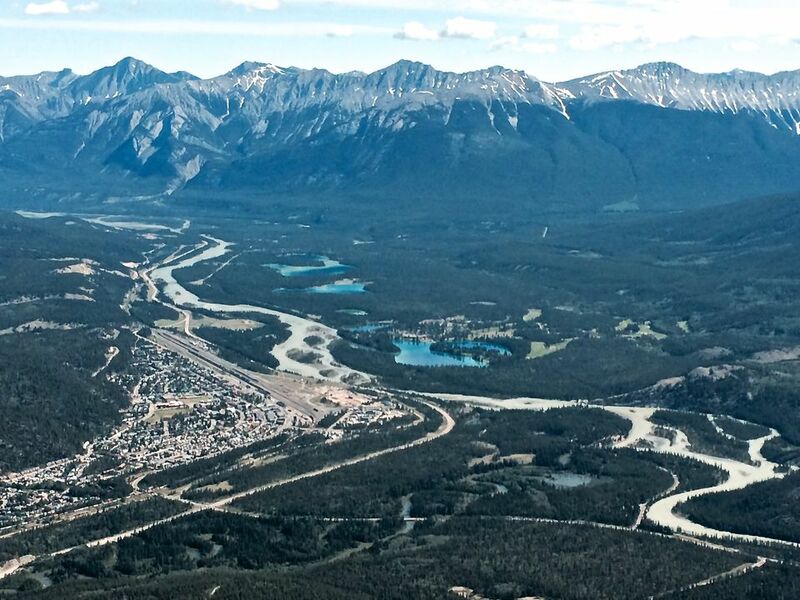 Nevertheless, one way to get a spectacular view of the town of Jasper and the surrounding landscape is the Jasper SkyTram. This 7-minute gondola ride up Whistlers Mountain is a fun, relatively inexpensive and rewarding experience for everyone, including children and dogs, and is for the most part wheelchair accessible. Once at the top of the Jasper SkyTram, you are free to roam Whistlers Mountain alpine tundra for unobstructed sensational views of Jasper, its glacial fed aquamarine lakes and the Rockies. Pictured above is a clear view southwest toward the BC/Alberta border. A previous visitor was nice enough to leave an Inukshuk for us to create a quintessentially Canadian photo. The Glacier Skywalk in Jasper, Alberta, is a cliff-edge walkway that leads to a platform where glass is all that separates you from a 918 foot drop. Access to the Glacier Skywalk is via Brewster Travel, which means you have to buy a ticket and take a shuttle to the attraction. A significant number of locals protested the Skywalk as a gimmicky addition that would compromise and restrict access to the natural surrounding beauty. After all, the stunning vista that the skywalk affords was once free to everyone who just pulled to the side of the road. Be your own judge. Or save your money and stop at any of the look out points that dot the highways. Book a Glacier Skywalk Tour with Viator. The 90 minute boat cruise across Maligne Lake - famous for its glacial blue waters - cuts through the snowy Canadian Rockies and ends at Spirit Island, one of Canada's most famous landmarks. The boat accommodates about 100 people and offers bench seating in a covered cabin. The front and back decks are open air. We had a lovely, knowledgeable guide who gave historical and geographical insight to our journey. Tickets are not cheap, but unless you canoe, there is no other way to explore this pristine region. Book a Spirit Island Cruise with Viator. Book a Spirit Island Cruise that includes a tour of the town of Jasper. Whether you look up at the looming mountain range or around you at the dramatic limestone formations that are a result of years of pounding water, Athabasca Falls is another Jasper locale that evokes nature's force and beauty. Walking trails, viewing platforms, informational labeling, and free parking make Athabasca Falls an easy 30 to 60 minute stop just off the Icefields Parkway and Hwy 93A. This scenic drive between Jasper and Banff takes you through the Rocky Mountains, past lakes and glaciers. The northern portion of the Icefields Parkway - part of which is open to visitors who wish to explore the glacier - is like stepping back into the ice age: giant glaciers, frozen mid-slide, surround this stretch of highway. Book an icefield adventure with Viator. This day trip leaves from Banff. Another stunning example of water's forceful impact and the artful creations it leaves behind, Maligne Canyon is a stunning, sheer limestone gorge that plunges down more than 50 meters (165 ft.). Lots of footpaths to choose from that are safe as long as you watch out for roots and can handle stairs. Six bridges give you excellent vantage points of the canyon and waterfalls. Also impressive and unexpectedly so is the Maligne Canyon gift shop, which has a comprehensive collection of Norval Morrisseau paintings. Apparently, the owner of the gift shop let the celebrated native artist live with him as a young man in exchange for the paintings that are hanging on the walls - today, worth possibly millions of dollars. Named for a British nurse executed during World War I, Mt. Edith Cavell is the grand dame of the Jasper peaks. A rather dodgy and winding 14 kilometre road (no camper vans; closed in winter) brings visitors to a parking lot from which they are free to explore gorgeous moraines, meadows, alpine flowers and spectacular views of Angel Glacier. A mere 15 minute walk from your car brings you to Angel Glacier, looming exquisitely over the turquoise waters of Cavell Pond. The silent and timeless beauty of this natural landscape will truly take you aback. You can even hear the glacier shifting and cracking. The short trek to Cavell pond and back has a wealth of interpretive signs and is the entirety of most people's visit to Mt. Edith Cavell. The parking lot and interpretive trail can be very crowded. Arrive before 9 am if possible. For the more adventurous, the Cavell Meadows Summit trail continues up (about 10 km of intermediate difficulty hiking) to meadows (full of wild flowers in spring and summer) and stunning views of the glaciers below. This terrain is very fragile; please stay on the designated trails so as not to disturb plants and flowers. Picking vegetation and feeding wildlife, including birds, is unlawful. Medicine Lake in Jasper, Alberta, forms by melting glacier waters in summer but disappears in winter by draining like a bathtub into the lake's bottom. The drained water then flows through an underground system of caves. Especially if en route to Maligne Lake, do make a stop at Medicine Lake for some photos or a walk about. It can look quite different day to day and often has a stunning reflection of the mountains which makes for impressive photos.